For decades, most commercially available opals have, for the most part come from either Australia or Mexico. Occasionally you'll see a precious opal from Brazil and a few come from Russia, Peru and even the United States. Recently we are seeing more and more jewelry grade opals coming from Ethiopia. 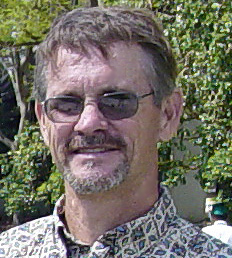 In the 1990's opal began coming on the market from the Yeta Ridge area. This opal occured inside of ryolite nodules, kind of like little geodes, usually a couple of inches across. Most of the nodules, which just look like roundish, gray rocks, have no opal inside. Mo st of the ones that do have opal contain just a reddish-brown "potch". But a small percentage will have beautiful, fiery, "precious" opal. It is sometimes orange, white or clear, but often it is a reddish-brown color which usually described as Mahogany or Chocolate opal. 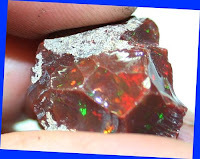 It most often has vivid red and green opalescence and looks quite unlike any opal I've seen from Australia. A couple of years ago, Opal was been discovered in the Gondar Desert region of Ethiopia. It is seam opal, more like what is found in Australia or Brazil. 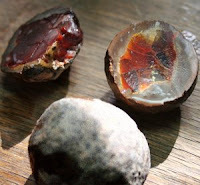 And just in the last few months, opal has started coming from Welo, Ethiopia. It displays very bright, broadflash fire and is quickly becoming very popular. Ethiopian opal has a reputation for being unstable, meaning that it has a tendency to crack or "craze". As with all opal, some is more stable than others. But if the stone is properly evaluated, cured and cut you can end up with good, stable gemstones that are truly spectacular! The opal from Welo is supposed to be very stable, but even opal from the same field can vary from piece to piece. Ideally, opal should not be boug ht or sold until it has had ample time to cure (dry out) after it is mined. Reputable miners will quarantine the material for a number of months to make sure that it isn't going to craze when fully dry. Great care must also be taken when the material is cut. If it becomes overheated in the cutting process it will crack. But if you buy your stones from a reputable dealer and handle them with reasonable care, they should be fine. Ethiopia is producing a great variety of opal for jewelry and collectors. 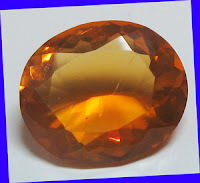 There is some beautiful Ethiopian, orange, fire opal that looks just like Mexican fire opal. I have seen base colors of white, yellow, clear, brown and orange with a full spectrum of fire colors. 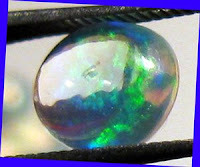 There are also "contra luz" opals from Ethiopia which show no fire when viewed from some angles, but vivid color when light hits them from the side. Some of the opal from Ethiopia is called "hydrophane" opal. Hydrophane, when it is dried out is opaque, usually white. But if soaked in water it becomes transparent!